Unsurprisingly, there’s a lot of things I had to learn to live without when I moved to France. While I don’t particularly miss having to wait for the signal before crossing the street or having to shout at people over the ridiculously loud music at restaurants, there are some things that I do miss. A lot. Like being able to eat poutine whenever I want. Let me tell you, those cravings are real. And then there are the things I thought I would have to give up until I learned how to speak French properly. In particular, I figured that going to the movies would be a thing of the past once I moved to France, but it turns out my worries were for naught. Upon arriving in Paris I discovered the joy of five simple letters: VOSTF. Version Originale Sous-Titrée en FRançais. Translation: Movies are shown in their original language with French subtitles. Those five beautiful letters meant that I could continue to go to the movies so long as they were in English, and bonus, they helped me with my French skills along the way. I’ve now become an expert in reading French subtitles, and it’s made me laugh out loud on more than one occasion to see the difference between the subtitles and the actual dialogue. In this vein, a shout out to whoever is responsible for subtitling Jonathan on Netflix’s Queer Eye. You either have a wicked sense of humour or you’ve just given up, but either way the results are hilarious. While I loved that I was able to continue to go to the movies in France, I quickly came to see that I was still missing out. France has one of the most storied and respected film industries across the globe, producing hundreds of feature films each year. Paris has the highest density of cinemas per inhabitant in the world, and France is one of the few countries where non-American productions command the largest share of admissions. This is the country that literally invented motion pictures, and I wanted to be a part of it. Not just reading it. After two years and far too many people incredulously asking me why I hadn’t yet seen Intouchables (apparently the Citizen Kane of modern French cinema), a new organization came to my rescue. 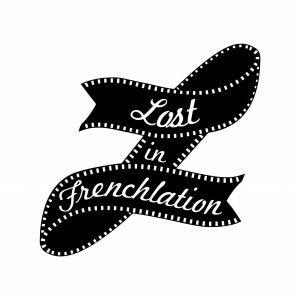 Lost in Frenchlation debuted in December of 2015, screening French films with English subtitles for the anglophone community in Paris. Born out of the desire for co-founders Manon and Matt to enjoy French cinema together despite Matt not speaking French, Lost in Frenchlation meant that I suddenly had access to current run French films. Needless to say, I was thrilled. Since its founding, Lost in Frenchlation has screened over 100 films at beautiful, independent cinemas across Paris. Cocktails and snacks are available before the show, and some screenings include a performance of some sort beforehand. The last movie I saw was a comedy, and therefore two stand up comedians performed before the show, but there’s also been dance performances, interviews with the film’s creative team, and wine tastings, just to name a few. All screening information can be found at Lost in Frenchlation’s website, so if you’re looking to experience true French cinema while in Paris, this is your ticket. Weirdest night at the movies? Bonus story – The weirdest night I’ve ever spent at the movies in Paris was hands down Call Me By Your Name. For those of you who may not have seen it, the movie is in a combination of French, English, and Italian. It’s one of the reasons why the movie is so great, but it also meant that I was constantly alternating between passively listening to the English, actively listening to the French (no subtitles for French in France! ), and reading the French subtitles for the Italian. I loved the movie, but my brain felt like it had gone through a blender by the end of it.